Charles Francis Xavier began his life in a struggle and it has continued ever since, but Xavier is not a man without willpower and each challenge has only served to build his character and strengthen his resolve. He is an activist, a teacher, a philanthropist and scientist - his dream is to bring mutant and humankind together. Even when that dream has seemed impossible to fulfill, he has pressed on regardless. While still in the womb, the son of Dr. Brian and Sharon Xavier faced his first challenge - his Mummudrai, the opposite of everything he was, given physical form in his twin sister. Although not capable of conscious thought, Charles was able to sense the inherent wrongness of his twin and instinctively lash out - using a mental blast to kill her. Thus, Charles Francis Xavier was born with a stillborn sister - or so he thought. He would find out some years later that this was not the case. The Xaviers were an exceptionally wealthy family, a mixture of old wealth and the money Brian had made as a particularly brilliant scientific mind. Although the family owned a large estate in upstate New York, Charles was born and raised in Alamogordo, New Mexico, where his father was working on a secret project documenting the genetic layout of mutant infants called the Black Womb project. Brian's work with nuclear power as well as his studies into genetics would have a terrible outcome, however, when he was killed in a nuclear explosion, leaving Sharon widowed and Charles without a father. Brian's research partner Kurt Marko, however, swept in and gave Sharon a shoulder to cry on - and the pair was eventually married. They moved back to New York to live on the family estate. While living on the estate, Charles began to develop his mutant powers - realizing that Kurt was really after his mother's money, but not sure enough to tell it to her. Kurt also brought his unruly son, Cain, into the household and Cain would often make life hard for Charles, bullying him because Kurt seemed to favor him over his own son. It did not take long before Sharon took to the bottle and Kurt took to beating her, and even though Charles used his budding powers to stop him from time to time as well as try to comfort his mother, it simply wasn't enough and she passed away not long after. It was in an explosion while he was arguing with Cain that Charles lost his only living parent, Kurt doing the only unselfish thing in his life and saving both boys from the fires before succumbing to death. Before he went, however, he told Charles that he had the chance to save Brian but had not taken it. It was with that Charles was left alone with a fortune; Cain bundled off to his own relatives to be cared for. Charles took his newfound fortune and made something of himself. Already an intelligent boy, Charles put his nose to the grindstone and graduated from Bard College at the age of eighteen with a degree in biology. Although in both high school and college he excelled at athletics, Charles chose to give them up in favor of academic study as he believed his telepathy granted him an unfair advantage. He left for overseas, attending Oxford where he gained his doctorates in biophysics as well as his MD. He met Moira Kinross here, wooing her away from her then-boyfriend Joe MacTaggert and starting a relationship with her. Although passionate, it was short-lived as Charles was sent away to fight in Korea. Charles was drafted, sent to fight in the Korean war and, as fate would have it, alongside his half-brother Cain Marko. Charles was not a killer, and so he was assigned to a search and rescue team where he gained the nickname the Good Shepherd, because he would always find the troopers and bring them home safely. It was out on one such mission that his unit came under heavy fire, and when Cain fled he chased after him - trying to bring him back to relative safety. It was while Cain fled that he stumbled across the Temple of Cyttorak, and discovered the mysterious red gem within it. Although Charles warned him not to, Cain touched the gem and was transformed into the Juggernaut, the temple crashing around him with Charles only barely managing to escape. Charles somehow knew, however, that Cain would one day escape and find him. It was only a matter of time. While Charles was away at war he received a letter from Moira, telling him that she had left him and gotten back together with Joe - and that they were going to marry. Although heartbroken, Charles resolved to travel the world and see the sights. He had had enough of war, and now wished to see what else there was on offer. He returned to Oxford where he received his degree in genetics before traveling to Africa and the Middle East, finally finding himself in Cairo where he met a young pickpocket named Ororo. He could sense something strange about her but was repelled when he tried to investigate, finding the source of this sudden attack in a man named Amahl Farouk - inhabited by the Shadow King, a powerful mutant telepath. Charles had never so much as seen another telepath before but he knew what had to be done and after a brief telepathic conversation, he projected himself into the Astral Plane where he fought the Shadow King and won. He traveled to Haifa, in Israel, where he met an old friend - Daniel Shomron. It was here that he used his powers to recover a catatonic holocaust victim named Gabrielle Haller from her disorder, as well as where he first met Magneto. Magnus and Charles revealed to each other that they were mutants, and set out to stop Baron von Strucker and HYDRA from stealing a large fortune in Nazi gold after kidnapping Gabrielle, who knew of its location. Charles and Magneto succeeded but realized that their two ideologies clashed and Magneto made off with the gold to start his crusade against humanity. Charles stayed in Haifa for a time with Gaby, but the eventually parted ways and Charles returned to traveling. It was while Charles was hiking through the Himalayas that he sensed a strange presence in a town and went to investigate, uncovering that an alien calling himself 'Lucifer' had the townsfolk under his control. He was preparing Earth for an alien invasion, and although Charles managed to thwart his plans he was fooled by the alien and crushed under a falling block. His legs shattered beyond repair, Lucifer teleported away and left Charles to rot. But Charles crawled his way out from beneath the rubble and halfway down the mountain, where, almost dead from exhaustion, he was found by Tessa who helped get him to a hospital in India. Charles was inconsolable (or so it would seem), but he met a nurse by the name of Amelia Voght and things took a turn for the better for the first time in a long while. Although Charles would never again walk, he found what he thought to be his soul-mate in Amelia and the pair moved back to America where they moved into the Xavier Mansion. They were happy for a time, Charles and Amelia confronted Magnus - who had become Magneto - at the ruins of Auschwitz where he confirmed Charles' worst fears. That he would continue to wage his war against humanity and there was nothing that Charles could do to change his mind. Charles resolved that he would have to stop him, returning to America where he found Scott Summers and turned him into the very first X-Men. He began to train him, teaching him to use his powers while Amelia watched on disapprovingly. She did not like the idea of mutants making themselves so widely known, and so she decided to leave Charles - and in his anger he reached out telepathically to change her mind. Although he immediately regretted this and rescinded his telepathic command, she slapped him and he knew that she would never again love him for having dared to try something like that on her. Charles had his X-Men to worry about, however, and assembled more young mutants at his Mansion - now a school - to teach them to control their powers as well as to combat the upcoming threat of evil mutants. Beast, Angel and Iceman were all found and recruited by Xavier. It was at the eleventh hour, however, that Xavier decided to include a young girl he had been tutoring for some time after the death of her friend in a car accident - Jean Grey. The X-Men now consisting of Marvel Girl, Beast, Angel, Iceman and Cyclops, they were ready. Xavier was, however, contacted in secret by Tessa - the girl who had rescued him in the Himalayas - and he chose to train her in secret, keeping her existence secret from the other X-Men. Eventually he planted Tessa in the Hellfire Club to spy on Sebastian Shaw. It was soon after this that Xavier attempted to combat the rising mutant hysteria in a television debate with Bolivar Trask, but his seemingly arrogant demeanor caused him to lose - Trask unveiling the first generation of mutant-hunting Sentinels. The X-Men managed to stop them, of course, but they would be a thorn in their side forevermore. Charles had watched Scott grow over time and recognized him as the best choice for the team's field leader and so he began to teach him the secrets of the Mansion. The X-Men were now truly beginning to take form. Soon after, however, Xavier attempted to reverse the curse that had turned his half-brother Cain into the Juggernaut and was put into a coma by the resulting explosion. The Juggernaut went on a rampage and the X-Men hurried off to stop him, eventually managing to do so but losing Charles to a group known only as Factor Three while they left the Mansion unguarded. They eventually found Charles again, discovering that Factor Three was in fact a group of mutant villains being controlled by an alien preparing planet Earth for invasion. The X-Men defeated him and rescued Xavier, who then told them that they had fully graduated from his school and were now free to do as they pleased. Charles learnt of another alien threat directly after this, however, and knew that he needed to go into seclusion to work on it without being bothered. He also knew that the X-Men needed their mentor and so he unlocked the telepathic abilities he had sealed away in Jean years earlier and charged the repentant Changeling with taking over as him while he hid in a psi-shielded haven deep beneath the Mansion. He was preparing to stop the Z'Nox from invading, but while he was working on this his duplicate was killed by Grotesk and the X-Men believed him dead - Jean the only one who knew the truth. Unable to reveal that it wasn't the real Professor, however, Jean said nothing and Xavier was thought dead and buried. Xavier, having planned out the attack, emerged from his hiding place months later (much to the amazement of his X-Men) and told them of his plan. He used all their powers together as one, taking the psychic energy of every person on Earth to force back the Z'Nox threat. It worked but Charles was exhausted, lapsing into a coma that would have been irreversible had it not been for the timely intervention of Bruce Banner who managed to awaken the Professor using a device of his own invention. It was soon after this that Cerebro sensed a powerful mutant on the island of Krakoa, and so Xavier dispatched his X-Men to investigate. They were surprised to find that the island itself was a mutant, and were captured with the exception of Cyclops. Xavier was forced to form a new team to rescue the old. There had been a number of mutants that Charles had encountered in his travels for one reason or another he had excluded from the first team of X-Men, but with his original X-Men captured he had no time for these reservations. He brought together Storm, Nightcrawler, Colossus, Sunfire and Banshee under the leadership of Cyclops and sent them to rescue the other X-Men. They were successful and returned to the Mansion, but the senior X-Men decided to distance themselves from the team in order to find a life for themselves outside fighting evil mutants. Charles respected this and began to recruit other mutants to his school, teaching them to control their powers and combat the evil forces that would threaten the dream they all shared. Charles made a wrong choice - one of his students was too brash, too proud, and he would pay for it with his life. This student was Thunderbird, who was killed while fighting Count Nefaria - all the while in a mind link with Charles, who felt everything that the young mutant did. Charles was hit hard by this and went on a leave of absence from the X-Men, his trusted friend Moira MacTaggert taking over in lieu of him. While he was away, however, he began to dream of a war between alien races and was shocked, upon his return, to find that his dream had become reality - meeting for the first time Lilandra Neramani, Princess of the Shi'ar Empire. She revealed that when Xavier had projected the psionic wave that repelled the Z'Nox, he had accidentally established a mental link with Lilandra and she had immediately recognized him as her soul mate. She also told them that she was on the run from the insane Emperor D'Ken, who planned to use weapons of great destruction, and she easily convinced Charles to send the X-Men to help. They were successful, and Charles began a close, romantic relationship with Lilandra on Earth. Charles' happy times were not to last, however, when Phoenix and Beast told him that they believed much of the team to be dead - killed in Magneto's citadel. Charles became guilt-stricken and Lilandra convinced him to come with her back to the Shi'ar Empire where she was now Empress. He left the X-Men for Shi'ar space where, while perusing their many archives, he learned the true nature of the power Jean Grey - Phoenix - now possessed. Terrified at the damage she would cause, Charles returned to Earth where he fund that the X-Men had survived the explosion of Magneto's citadel. He took over training the new X-Men, becoming strict with them as he had been with his first students until Cyclops convinced him to realize that they were no longer children and needed more freedom. Charles relented, but the power that Phoenix had corrupted just as he had thought it would and Dark Phoenix threatened the Earth with phenomenal destruction. Although, through telepathic intervention, Charles returned Jean to control over the Phoenix Force, the Shi'ar declared that Jean should be executed to prevent another such situation. Charles, now familiar with the Shi'ar ways, challenged Lilandra to a duel in order to save Jean. She agreed, but during the fight Jean killed herself, understanding the danger she posed to the rest of the universe and fearing what she might do. Charles, although saddened by the loss of Jean, continued to recruit new X-Men to the fold and placed Storm in charge while Cyclops was away - grieving Jean's loss. Things were not so simple, however, as Xavier was kidnapped and implanted with the embryo of the Brood Queen. Although he attempted to discover the source of a strange new presence within him, he was knocked unconscious and unable to discern its nature. The embryo manipulated him into gathering the new team of X-Men around him as a personal army, but when it hatched things did not go as planned - Charles maintained control of the Brood Queen, his old body destroyed. With the help of Moira MacTaggert he was able to transfer his mind into a cloned body - one without his disability. Charles, now able to walk, took over leadership of the X-Men (much to the chagrin of Storm) and a number of issues began to arise. Charles was not the great leader in the field that Storm was, but Storm had lost her powers and left the team - leaving Charles with the tough choice of picking a new field commander for the X-Men. After learning of what the future would be like if he died and his dream failed from Rachel Summers, he put Nightcrawler in the position of leader. He took an inactive role with the team, teaching at Columbia University until he showed sympathy to mutant kind in one of his classes and was beaten nearly to death only to be saved by the Morlocks. He was told to go easy or his body may deteriorate but he paid this no heed, immediately traveling to Muir Island where Moira MacTaggert had called him to see an old flame - Gaby Haller. Her son David had been born autistic with a number of other psychological ailments, and when Charles attempted to enter his mind to save him, he was trapped along with a number of others, including Moira. Charles convinced David, who he found out was actually his own son, to let him and the others free by telling him that he would always be for them. It was soon after this that Charles convinced Magneto to help him face off against the Beyonder, and after the battle Magneto decided to stay at the school and redeem himself. Charles, having returned to work at Columbia, was attacked again and his body began to deteriorate - a secret he kept from the others. After testifying on behalf of Magneto during his trial, Charles collapsed and was about to die when Lilandra and Corsair of the Starjammers arrived to save him. Charles made Magneto promise to lead the X-Men just as he had before going with Lilandra, healed aboard the Starjammer and whisked away to Shi'ar space. Things in Shi'ar space had turned south. Deathbird had taken the title of Empress and Lilandra, as well as the Starjammers, were now rebels and terrorists for trying to oppose her. Charles fought with them for a while, serving in combat with them but unable to travel back to Earth as the intergalactic engines of the Starjammer were badly damaged. On a distant world Charles found Magik, one of his former students, and managed to rescue her along with the other New Mutants - learning from them about a number of dreadful events that had taken place back on Earth in his absence. Although he wanted to return in order to consol his students after the mutant massacre, the Starjammer still needed him and unwilling to abandon them he sent the New Mutants back to Earth without him. Charles fought with the Starjammers in the rebellion against Deathbird for some time after this, eventually helping Lilandra retake the throne and learning that the Shadow King had returned. More importantly, he had taken over the entirety of Muir Island - this convinced Charles to return to Earth and aid his X-Men. He went with them to attack the Shadow King and in the ensuing fight on the Astral Plane his spine was shattered and his son, David, was possessed and apparently rendered brain dead. Charles was once more confined to a wheelchair; the period of being 'a whole man' that he had enjoyed was over. But he was resolute nonetheless, for the Dream was still alive and they had fought to keep it that way. Now Charles finds himself back in Salem Center. His X-Men are plentiful and he's divided them into two teams (Blue and Gold). With them, Xavier will ensure that the Dream will continue. After an assassination attempt made on him by Stryfe, Charles was infected by the Techno-Organic Virus which (after being saved by Apocalypse for reasons unknown) granted him a few hours of the ability to walk. Although he knew he could have done anything, Charles remained true to his X-Men and decided to bond with them by going rollerblading with Jubilee. It was soon after this that Magneto, who was thought dead, rescued Charles when the Blackbird was shot down in the Savage Land and it became clear that Magneto was up to his old tricks - gathering his Acolytes to once again stage his war on humanity. In the fight that ensued, Charles donned an exoskeleton that allowed him to walk and apparently erased Magneto's memory entirely with a powerful mental bolt after witnessing Wolverine's adamantium skeleton literally being ripped from him. Although Magneto was seemingly gone, Charles had unwittingly absorbed much of his personality and when a mutant, seeking refuge in the Mansion, was beaten to death by an angry mob on his doorstep - Charles began to slip into darkness. He broke up with Lilandra, the pair of them unable to sustain their relationship with light years between them, and became more and more reserved and angry. Finally, Xavier began to project another personality - that of Onslaught, a hybrid of the repressed anger of Charles and Magneto's mindset whose sole goal was having mutants rule the world, thus forcing cohabitation upon everyone. Xavier was freed from Onslaught, but not after Nate Grey and Franklin Richards had been absorbed - allowing Onslaught a life of his own without Xavier to project him into reality. The colossal fiend learned of the Age of Apocalypse reality from which Nate hailed and decided that no life was worthy and decided to destroy it all, leading to all the heroes of Earth gathering to stop him. Onslaught was defeated after the sacrifice of dozens of heroes, but Xavier was left powerless and in the custody of the United States government - under the watchful eye of Bastion. Operation: Zero Tolerance began, led by Bastion, and the X-Men became fugitives while Xavier remained in prison. The threat of Bastion was ended without him, but Xavier had managed to free a newly-created girl with incredible telepathic powers - Nina - while in custody and she returned to give him back his powers after he taught the Brotherhood to work as a team and defeat the sentient Cerebro. Charles was present when Apocalypse attempted to gather the Twelve, theoretically gaining near-omnipotence for himself. Although his attempt failed, Cyclops was lost in the battle and Charles decided to leave Earth with Cadre K - a group of mutant Skrulls who were desperately in need of a leader. The X-Men no longer needed Charles as much as they once had, but Cadre K definitely did and Charles aided them in finding and training other young mutant Skrulls in a far off corner of the galaxy. Xavier taught them and traveled with them in a series of adventures which culminated in preventing Earth from becoming a Prison Planet where intergalactic criminals were sent. Finally convinced that they could look after themselves, Charles stayed on Earth and bid Cadre K farewell. Xavier was shocked out of his seemingly pleasant return when Muir Island was attacked by the Brotherhood and Mystique, and although this particular attack was repelled Moira was fatally wounded as a result. Charles merged her psyche with his own in order to retain the knowledge of the Legacy Virus and maintain the hope of one day bringing Moira back. Things did not get any better when Colossus sacrificed himself to release the cure into the atmosphere, effectively saving the entire mutant population of the planet Earth. Magneto, now the sovereign ruler of Genosha, was once again threatening World War Three and ended up being gutted by Wolverine - Charles trying to stop him but failing. Charles returned to the Mansion where he bore witness, via Cerebro, to Cassandra Nova - his sister thought stillborn - killing sixteen million Genoshans with a fleet of Sentinels. Aware that Xavier was watching, Cassandra changed minds with him - leaving her own decaying, dying body as a prison for his mind while she used his body for her own ends. After revealing that Xavier was a mutant to the general public, she took him to the Shi'ar Empire where she caused great turmoil with Lilandra. Taking control of the entire Shi'ar battle fleet, she returned to find that Jean had scattered part of Xavier's mind (after freeing it from Cassandra's dead body) to different minds all across Earth. Cassandra, in Xavier's body, attempted to use Cerebra to perform the mass genocide of mutantkind but was suddenly in contact with Xavier's scattered essence. He attacked her, retaking control of his body and being healed by Xorn - who once again granted him the power to walk. Although he was in control, Xavier still had to deal with the fact that he was publicly outted as a mutant and that Lilandra had been driven mad. Their marriage was annulled and, in response to his sudden public status, Charles opened the Xavier Institute for Higher Learning the public, known to all mutants as a place to safely learn as well as establishing the X-Corps to protect and rescue mutants across the globe. It was at the same time that Charles made amends, to a degree, with Cain Marko and convinced him to come back to the Mansion - as well as hiring Mystique on to work as covert operations. When Xavier attempted to bring humans in as students at the Institute, however, there was a riot and several people were killed. Charles began to doubt his methods, and planned for Jean to take over as headmistress. When Xorn revealed himself to be none other than Magneto (Charles knew this was not the case, however) and destroying the Mansion as well as revealing that Charles' spine had been healed by magnetically-influenced machinery and rendering him a paraplegic again, the X-Men sprang into action. Although 'Magneto' was apparently killed in the following battle, Charles accompanied the Master of Magnetism's coffin to Genosha where he confronted the true (and very much alive) Magneto. The pair finally reconciled their differences, at least for a time, and united to rebuild the sentinel-ravaged Genosha into the nation that it once was. While on sabbatical in Genosha, helping to rebuild, the Danger Room gained sentience - able to kill now that it had allowed Wing to commit suicide inside it. The X-Men were unable to defeat it because they had fought it countless times and it knew them, but it had never fought Xavier and with the timely intervention of the X-Men he was able to beat 'Danger'. The newly returned Colossus, however, had learned that Xavier had discovered the Danger Room was sentient years ago when he first infused it with Shi'ar technology. Disgusted with Xavier, the X-Men left him in Genosha with his group of ex-villains and rebels - apparently deserting him for the last time. Charles remained there alongside Magneto, Doc McCoy, Callisto and others trying to piece together the nuclear wasteland and reunite it's scattered survivors. In other parts of the world: The Scarlet Witch killed many Avengers due to a mental breakdown and Magneto, concerned, asks Xavier to telepathically communicate with her, hoping to calm her down. Xavier is unsuccessful though and calls a meeting with the X-Men to decide Witch's fate. Wanda's brother Quicksilver believed they are planning to kill her and convinces her that she can right her wrongs. There, she created an alternate reality where mutants are the majority and where Magneto is the ruler and Xavier is believed to be dead on Genosha years ago. A mutant named Layla Miller restored some of X-Men's and Avengers' memories and they headed to Genosha to discover that Magneto had erected a memorial for Xavier where his grave is. Cloak went through the grave to find that a body wasn't even there. Scarlet Witch then altered the reality once again where she caused mutants to be on the verge of extinction and by taking away their powers. The powers were collected into a massive energy ball called The Collective (who was recently Xorn). Even though Xavier's body is missing, they try to find him through Cerebro but cannot detect him. In the Deadly Genesis series before Xavier had sent a team to rescue the X-Men on Krakoa, he had sent another team from Moira and one of the students was Vulcan who was a brother of Cyclops. It was traumatizing for Cyclops knowing that he had a new found brother only to be killed after a brief meeting. In order to save Cyclops's life, Xavier wiped his memory of Vulcan and then assembled a new team, without the knowledge of Moira's team revealed to anyone else. The Collective revives Vulcan and the youth attacks the X-Men causing Xavier to come out of hiding. His legs have been restored after the House of M events and he was no longer a mutant. Vulcan forces Xavier to tell what he had done to Cyclops. Cyclops is angered by this and is ostracized by him, but some of the students are more forgiving. Xavier still forms a new team to battle Vulcan and take revenge on the Shi'ar Empire. While on the way, he is kidnapped by Chancellor K'Tor, who is the Shi'ar Vice Chancellor. Charles was then transported inside the M'Kraan Crystal by Vulcan, where his mutant powers were restored. He was later saved by Darwin and both of them, together with Warpath, Nightcrawler, and Hepzibah all escaped back to earth with the help of Lilandra. They left Havok, Marvel Girl and Polaris to form the new incarnation of the Starjammers with Corsair's old crew, after he was killed by Vulcan. Upon returning, he begins a search for Magneto, hoping to find him before the US government does. He is still team leader and his team now consists of Nightcrawler, Warpath, Storm, Hepzibah and Caliban. Xavier talks to Val Cooper about what has happened to Caliban and how the O*N*E wants him. Later while the rest of the team begin looking for the Morlocks, who have been taken control of by Masque, who is also looking for Magneto. Charles and Nightcrawler leave in a X-Jet to find Magneto. They are unnoticed by the Sentinels as Xavier had placed a cloaking device on the plane. Charles and Kurt travel to where someone claimed to see Erik. They arrive at a graveyard in Germany and they find out that Erik was looking at the headstone of one of his former loyal henchmen who had died since M-Day. Their search is cut short once they find out the Morlocks plan to blow up a church. The team stops the Morlocks and returns to the mansion. Back on earth, he encountered a very angry Hulk, who was searching for the members of the Illuminati, a group that had exiled him. Although Charles was not in attendance when the decision to exile the Hulk, he said that he would agree on his exile, but would eventually bring him back to earth in search for a cure. Nevertheless, the Hulk fought and defeated every X-Man that came and defended their mentor. He only stopped when Mercury showed him the gravestones in the Institute grounds and how the mutant population had been reduced to a few hundreds. Hulk having sensed that Charles had suffered enough soon left. During the Messiah Complex event, Charles detected a new mutant since M-Day that is powerful enough to overload Cerebro. He asked Cyclops to send a team to retrieve the baby but they come back empty handed. Charles criticized Scott's decisions concerning the situation they are now in, from sending a team of X-Men finding the Acolytes, to forming the X-Force to track down his own son, Cable, but Scott only wanted Charles to leave the mansion because he has become a distraction to him. Sometime later, Professor X was contacted by Cable about losing the mutant baby to the traitorous actions of Bishop, who in turn, lost the baby to the Marauders. Charles was later accidentally shot by Bishop, who was aiming for the baby. With the Professor dead, Cyclops declared that the X-Men are to be disbanded. Later, it is revealed that Professor Xavier survived the gunshot inflicted by Bishop but he is in a coma. He is kidnapped by Exodus with the help of Tempo and Omega Sentinel. Exodus tries to heal Xavier but while in the coma, Xavier fights Exodus. In the end, Exodus approaches Magneto himself, who is apparently still depowered. Magneto and Omega Sentinel are able to stir up Xavier's memories, coaxing him out of his coma, but he is slightly confused and partly amnesiac. Later, as Exodus confronts Magneto about Joanna Cargill's fate, and is about to kill him, Xavier drags him onto the Astral Plane, putting his own restored mind at stake. After a psionic battle between the two, Xavier defeats Exodus, who reveals to him that the reason he abducted and restored his mind is that he wanted Xavier to lead the Acolytes and find the mutant messiah child in order to indoctrinate her into their cause. Xavier, disgusted with Exodus' words, calls him a fool and refuses to help him. During the battle between him and Exodus, Emma's telepathy picks up on the fight, and she realizes that Xavier is alive and tells Cyclops. After Xavier, Magneto and Omega Sentinel depart from the Acolytes' base, he leaves them both in order to try and regain his lost memories by visiting people from his past. His first visit was the with now depowered Carter Ryking (formally known as Hazard), who is a patient at the Ryking Secure Psychiatric Facility for going insane after losing his powers, and became more mentally unstable. Carter allowed Xavier to search his memories, to help him recover some of his memories. While doing this, Xavier discovers that when they were young, they were test subjects for Mister Sinister (he was called Nathan Milbury when Xavier was young), which was approved by Xavier's father. It appears that Mister Sinister had been manipulating Xavier's life for quite some time. Xavier eventually discovers that Mister Sinister plans to use him, Juggernaut, Sebastian Shaw, and Carter Ryking as potential hosts for Sinster's mind to take over by a machine he made. Xavier begins to bleed, and suddenly gives into Sinister. However Xavier is still alive, battling Sinister to regain his mind and body. Sebastian Shaw and Gambit find the machine of Mister Sinister and destroy it. Xavier defeats Sinster and removes him from of his body. After thanking Shaw and Gambit, he leaves them to go and see Cyclops. Xavier returns to the X-Mansion, only to find it in ruins. He leaves it to meet up with Cyclops after threatening him for the visit. Xavier tells Cyclops how Sinister was manipulating Cyclops's and Jean's lives and wants Cyclops to give him permission to scan his mind for any of Sinister's influence. However it turns out that Cyclops had secretly invited Emma Frost to their meeting and had entered into Xavier's mind. She shows Xavier his past and the wrong decisions he has made, for example: erasing Beast's existence from the minds of everyone who knew him, not believing Rogue when she needed his help, and erasing Cyclops's memory of meeting his brother Vulcan. Knowing what he had done was wrong, he says he must move on with his life and try to deal with the consequences. Emma ends inspecting his mind and reminded him of Moira Mac Taggert's last dying words. Xavier gives his blessing to Cyclops and continues his path to regain part of his memories. Xavier helps Wolverine to bring his son Daken from the Hellfire Club. After helping him, Xavier meets his step-brother Juggernaut. He finds Juggernaut in a bar, in which he has damaged, and has kept the costumers and the waiter trapped inside. Xavier and Juggernaut talk about the meaning of the name Juggernaut. They also talk about the time Cain was trapped in an another dimension, how he found the crystal that gave him his powers, and when he joined the X-Men. After they finished their conversation Xavier gave Juggernaut a small box as a gift, telling him to open it after Juggernaut kills him. Juggernaut eventually kills Xavier and is shown moving on with his life, defeating the X-Men, and having everything he wants. It turns out that none of what happened was real. When Juggernaut opens the box, given to him by Xavier, Xavier appears to him and tells him that everything that has happened except for smashing the bar happened in Juggernaut's mind. Charles tells him he entered his mind while he was sleeping. Xavier now understands Juggernaut better, and knows the path he chose to walk, but warns him not to stray onto his. Xavier's next path is to find Rogue. Xavier recruits Gambit to join him to go to Australia to find Rogue, who is staying at the X-Men's old headquarters. When they arrive, they find themselves trapped in Danger's holographic projection, in which it projects only Rogue's past life moments and her moments with the X-Men. After encountering some events in Rouge's life, Charles and Gambit encounter a Shi'ar salvage crew who were responsible for damaging Danger, which is why she created this holographic projections. They join Xavier and Gambit in finding Danger. They finally find where Danger is, and Xavier enters inside her to fix her. When inside, Danger tries to attack him, sensing an unauthorized intruder, in the last second he uses the password. She shouts at him telling him that he used her as a slave, stole her of herself. Xavier reveals to her that when she said her first words "Where am I?" he went and checked with her Shi'ar makers. They assured him that it could not happen. However, he felt her awareness, and her emotions. He explained that he wanted to release her, it's just that there were billions of lines of machine codes, he didn't know which line to erase without lobotomizing her. And even if he had succeeded, he feared that she might kill his X-Men, knowing everything about her. So he let her suffer while he watched. Xavier ends her suffering by fixing her, in which everything returns to normal. The Shi'ar crew shoot at Xavier, as they intend to take both Xavier and Danger to their emperor, Vulcan, who has put a bounty on Xavier. Rogue comes to their rescue and Xavier awakens Danger to help Rogue and Gambit. After defeating the Shi'ar crew, Xavier and Danger are able to help Rogue gain full control over her powers. Xavier was shown to be at a meeting with the Illuminati, who were discussing the Skrulls' plan to invade earth by replacing the super heroes with Skrulls posing as them. Knowing that none of them can trust each other (of the possibility of being replaced) they disband the team. Norman Osborn and his Dark Avengers arrive in San Francisco to enforce the law and to stop the anti-mutant riots that is going on in the city. Xavier appears to be with Norman Osborn and encourages his law, telling Cyclops publicly to turn himself in. This Xavier turns out to be Mystique, who was recruited by Norman Osborn to help him. The real Xavier is imprisoned in Alcatraz by Norman Osborn, and is slowly losing his telepathic powers. He was able to make pisonic contact with Beast, who is also imprisoned. Emma Frost was able to find the real Charles Xavier, explaining that both of them are Omega class telepaths. In battle against Norman Osborn and his Dark Avengers, he and Emma try to remove the Void from the Sentry, unfortunately, a sliver of the Void enters her mind. Xavier quickly tells her to transform into her diamond form to stop the Void from taking over her. After the events of Utopia, Xavier has come to live on the risen Asteroid M, now named Utopia, along with the rest of the X-Men and is also allowed to join the Utopia lead council (Cyclops, Storm, Namor, Iceman, Beast, Wolverine and Emma Frost). While he no longer continues to openly question every move that Cyclops makes, he is still concerned about some of his leadership decisions. While attending the funeral of Yuriko Takiguchi, Magneto arrives at Utopia under peaceful terms. Xavier does not believe it, and attacks Magneto telepathically, causing Cyclops to force him to stand down. He later apologizes to Magneto for acting out of his old passions from their complicated relationship, which Magneto accepts. Professor Xavier is seen delivering a eulogy at Nightcrawler's funeral. Like the other X-Men he is saddened by Kurt's death and anxious about the arrival of Cable and Hope. At the conclusion of Second Coming event, Professor X is seen surveying the aftermath of the battle from a helicopter. As Hope descends to the ground and cradles Cable's lifeless arm, Xavier reflects on everything that has occured and states that, that he feels that Hope has indeed come to save mutantkind and revive his dream. After his students become corrupted by the Phoenix Force, Xavier joins the fray in helping the Avengers through various points. He has asked Cyclops to stop and tried to fight with Phoenix avatars, Magik and Colossus. Eventually, Xavier enters Scott's mind to hide the oncoming Avengers team. After attempting to shut down Cyclops, Scott assaults Emma, taking her power. With the full influence of the force coursing through Cyclops, he deals a fatal blow to the man that was like a father to him for years. Charles' death shook both the Avengers and X-Men deeply. In an interrogation with Captain America, Cyclops claims that Xavier was responsible for whatever good was inside him and that his death was a tragic and personal loss to him but that it was worth it for the re-emergence of mutants, a claim that infuriates Rogers. Rogers says that Charles Xavier was one of the finest men he knew, that his death had no redeeming factors and that he pitied Summers if he thought so. Later, Alex Summers paid his brother a visit and coldly tells Scott that he was selfish during the Phoenix affair and that he abandoned Xavier and his teachings before killing him. The Scarlet Witch visits Xavier's memorial reminiscing over Charles' kindness to her over the years despite her parentage. She mourns her role in his death and avows to uphold his dream. The sight of Wanda Maximoff at Xavier's grave proves too much for a nearby Rogue and an argument is instigated between the two women. It is unknown whose body, if any, is buried at the Xavier Memorial. The universe was destroyed and reformed by the god, Doom. The Secret Wars began and the various versions of Xavier co-existed in the many regions of the BattlePlanet. When Reed Richards reformed the 616 universe, the Phoenix Force collected the remains of Xavier and brought him into the White Hot Room. There, Xavier was reconsituted and made whole again. Now, thought dead by the world at large, Xavier will emerge from the White Hot Room and return to Earth where he will attempt to restore the dream. Charles invests a great deal of himself into his students. However, often through his X-Men, he's playing a larger game with the motive of securing an equal and peaceful future for all. This is a great challenge, constantly demanding that he counter the moves of various threats on the proverbial chessboard. Charles is keenly aware of how old he's getting, and a mutant with both his strength of morals and powers may not be seen again. So, his motives circle back to raising students he can trust to play the game until equality is achieved. Charles only remaining goal, vast though it may be, is to secure a brighter future free of discrimination and injustice. He would die for that, and nearly has on some occasions. Although he remains actively involved in the fight, he entrusts much to his X-Men today, both as their alter egos and the more public teachers of his students. Few things are more important to Charles than his children, and pity for the poor soul who visits the mansion's doorstep looking to do them harm. Charles Xavier is a man who has difficult showing his emotions, not because he does not have them or he is any way emotionally stunted but rather he believes he must exude a teacher-like quality that has little time for anything else. Long ago Charles decided that mutant and mankind should live in harmony if there was to be peace, and he imposed upon himself the role as the savior of all members of the Homo Sapiens Superior genus. He has, over time, tried to change his methods, ranging from being closer and more personable with his students to being distant and strict, refusing variation from the course of action that he himself has planned. His methods of teaching reached, more recently, a comfortable middle ground where he, while strict, does not distance himself from his students too much. After all, the Xavier School (or what ever name it goes by now) is a public institute now and he cannot (and will not) attempt to hide himself any longer. Charles is quite determined when it comes to teaching young mutants how to control their powers. Although initially the purpose of this was to help his X-Men fight their enemies more effectively, it has grown to be something more than that. There are many mutants out there who have powers that can be dangerous to themselves or others, and Xavier has resolved himself to teach them to control their abilities for their own safety and that of others. He is not a teacher who only wants them to learn to use their mutant powers, however, and Charles believes in a well-rounded curriculum that includes all the basics from English to Mathematics to various language courses. He is a classical teacher in these respects, believing in the blackboard and the lectern rather than alternative teaching methods. Beyond his, he prefers to be called Professor Xavier - often allowing his nickname of Professor X - and only his close friends call him Charles. While it may not necessarily bother him to be called Charles or any derivatives thereof, he maintains a professional air when teaching and certainly doesn't encourage it. Because of the fact that Charles long ago decided that he was the one to bring peace between humans and mutants, he has placed a lot on himself and it wears on him accordingly. Whenever he loses a student, or indeed anyone, because of his cause he feels tremendous guilt. He has more than once felt the death of a student through a mind-link and these wounds never heal properly. Because of this he has his own inner-demons that cause him to doubt himself from time to time and step away from his X-Men, immersing himself in other things. But every time Charles will always come back to the belief in his cause, unwilling to give it up - believing that if somebody died for it, it would dishonor their memory to throw it away. Charles believes that there is inherent good in everyone, and while he may not necessarily trust them (he holds leverage over more than one person currently working for him) he has the eternal hope that working for his cause will make them see the error of their ways. He is a man who likes to be prepared, and therefore whenever he brings an ex-villain into his fold he always keeps a close eye on them and is ready to be stabbed in the back. It is very difficult to pull the wool over Charles' eyes, not only because of his powers but because he is a naturally intelligent and perceptive man. There are still a number of times where he has been fooled, however, as with people like Magneto or his half-brother Cain he can often be blinded by friendship and love which has been his downfall. Finally, Charles is a classical man in many respects. He enjoys the more refined things in life such as Shakespeare, classical music, fine wine and cuisine. This causes him to come across as stuffy and conceited to those who do not know him, and although he is not really this way he is confident and respect must be earned from him. He may care for others and even put himself out to help them but the fact remains that he will not respect them until they earn it from him. Charles is a mentor and teacher more than anything, taking a backseat to the field and instead acting as both the communication hub and the source of information. He will get involved if he has to, but he has issues when it comes to being a field commander - an example being the time he fought with the X-Men in Japan and became trapped under a rock, flying into a panic at the fear that he may have been paralyzed again. Overall, Charles is manipulative and not beyond telling people what they want to hear rather than the whole truth in order to twist things in the way he feels is best. He believes in the greater good, willing to sacrifice everything for it - an example of this being the fact that he ignored the Danger Room's sentience in order to use it to train the X-Men. He feels tremendously guilty doing these kinds of things, however, and tries to be truthful with his students but the fact remains that when he sees no alternative he will take this route, not willing to let his Dream be harmed because of an individual. He does not care about his Dream more than his students, rather he feels that letting it fall apart would be a great disrespect to them and that in the long run they will understand. Charles Francis Xavier is arguably the most powerful telepath on the planet, and in the opinions of those who know him there is no 'arguably' about it. 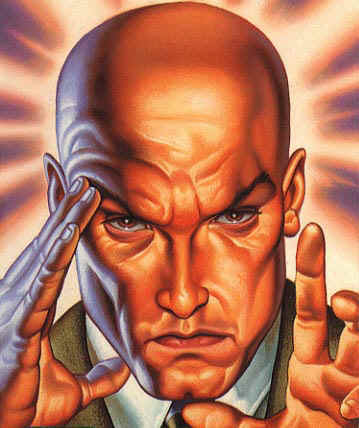 Even in the womb, Xavier possessed the mental power to telepathically kill and his power has been developing ever since then - rendering him totally bald but granting him phenomenal power in return. Charles has mastered every aspect of telepathy, able to perform almost any mental feat one cares to name without hassle. What makes Charles' power a truly astonishing one is the fact that it is coupled with incredible willpower, and when it comes to a battle of minds, Charles is truly a giant among insects. Even without using artificial means to enhance his power, Charles is able to reach out across great distances to communicate or project an image to a targeted mind or group of minds. His power can be divided up into a number of different feats, all listed below in greater detail. The mind probe is the aspect of telepathy that allows Charles to delve deeply into another mind, although only on a one-to-one basis, and search through memories, knowledge, thoughts and anything else that is there. The mind probe is a powerful tool, and with time it can allow Charles to view memories with absolute clarity that even the person whose mind he is probing cannot remember at all. The difficulty of this varies depending on the mind and the strength of will behind it; there are some individuals with whom a mind probe is simple and takes no time at all while there are others who are especially willful and skilled at resisting. With these people it may take a great deal of exertion on Charles' part but given time there are very few places he could not eventually go. Only those with phenomenal willpower or impenetrable psychic shielding (like Magneto's helmet) can resist him indefinitely. This power can only stretch over a few miles, but using artificial enhancements like Cerebro/Cerebra can allow it to stretch much further. Charles must, of course, be concentrating to do this and so he cannot be doing anything else while he is using it. This is a rather sticky subject, as the degrees of mind control vary greatly and Charles is capable of all of them. It can range from simple psychic suggestion, mentally coercing someone to draw a particular opinion without knowing they are being influenced, to total mind control - where Charles literally takes over control of the target's mind, making them do whatever he pleases. While Charles is able to talk and coerce somebody psychically at the same time without so much as batting an eye, to control another mind entirely he needs complete focus and is incapable of doing anything else while he is in control of another body. However, Charles can also control minor actions like forcing a sudden hand motion on a target or taking partial control while still maintaining function in his own body. This is a power that Charles does not abuse, and the only time he uses it is when he has to - for example, on an enemy who needs to be subdued, or to convince someone away from violent action. There have been times in the past where he has used it selfishly to try and change the mind of Amelia Voght who wanted to leave him and he immediately regretted it. Because of this, this is a power that Charles will only use when it is absolutely imperative that he do so. This is the ability to hit an opposing mind with a blast of sheer telepathic force, causing anything ranging from a brief moment of pain to death. Charles usually requires visual contact with the target to use this ability with accuracy, but if he knows what mind he is looking for he could quite capably strike that mind dead within a radius of several miles if he wanted to. Charles can also do something of a psychic scream over a large area, quite possibly an area the size of New York City, that everyone would feel - maybe even temporarily disorienting all the minds in that radius. This would be a great drain on Charles, however, and it is not something he would do on the fly as he would be very limited in his capacity afterward. However, to really do damage it is best that the mind he is attacking is close to him. He can induce unconsciousness, extreme pain, death or just mild discomfort depending on the severity of the blast. The wider and less discriminate the radius is, however, the less damage he does. This denotes Xavier's ability to delve into one (or many) minds and create illusions that the mind views as real. Because the mind is what interprets sensations, the illusions can fill every sense and seem one-hundred percent real to the person who is experiencing them. Xavier can basically broadcast this illusion, anyone within the vicinity experiencing it just like everyone else unless he mentally designates them as not experiencing the illusion. Xavier could broadcast this illusion over an area the size of the Xavier estate with great concentration, provided he isn't doing anything else at the time. It could theoretically spread even further with the use of Cerebra. The extent of these illusions are only limited by Charles' imagination, basically anything he can conjure up in his mind he can make seem absolutely real to another mind - provided he can break into that mind, of course. Protection against psionics, of course, renders this power totally ineffectual. This deals with Xavier's ability to erase memories, knowledge and basically anything else from a mind. This can be done in an instant for surface thoughts such as short-term memory, or may take a lengthy session with a great deal of concentration on Xavier's part for memories or knowledge tightly engrained and hidden deep in the mind. If he really wanted to, Xavier could erase someone's memory completely and construct for them a new life, making them believe that they are somebody else, equipped with new memories and all the works. Of course, he could also just leave them totally blank - with no idea as to who they are or where they came from. Of course, total erasure of one's memories can take an exceptionally long period of time (if the target is willing or unconscious, it can happen much quicker) and due to his own ethical standards it is not something that Charles undertakes regularly. Even with particularly evil individuals, Charles shies away from this tactic due to the fact that it is irreversible. There is another aspect of a mind wipe that Charles is prone to using more often, which involves setting the adding of various blocks and walls into the mind of the target. This can be used for anything from locking away important information so that only a skilled telepath capable of bypassing his psychic walls is able to gain access to it, to sealing off mutant powers so that they cannot be used until the blockage is removed or otherwise broken down by a particularly stressful or emotional response. An example of this would have been when Charles sealed away Jean Grey's telepathic abilities due to the fact that she was not able to handle them. Charles could do this with anything but physical powers, locking off the unconscious part of the mind that activates the powers. This would not, of course, work for a power like Wolverine's healing factor or Beast's agility due to the fact that these are automated physiological responses not controlled by the brain. This deals with a power that seems to be almost unique to Charles, a feat associated with his telepathy that has allowed him to gather together a number of mutants over the years. Even without the enhancement of Cerebro or Cerebra (which, as it happens, allows him to search for mutants over areas as large as the Earth) he is capable of sensing a mutant and their powers simply by being within a few miles of them. Charles is not constantly inundated with the sensations of nearby mutant powers, but rather when he looks for it he is easily able to detect it without much effort. He is not able to discern what the mutant is capable of (besides the obvious) but he can pinpoint their position within an area the size of the Xavier estate, but beyond that it can get fuzzy without the aid of Cerebro or Cerebra. Because of this, Charles is able to use his telepathy to recognize the 'psychic signatures' of those mutants he knows well and sense where they are before actually seeing them. Telepathic communication is what comes easiest for Charles, a man who has, at times, demonstrated the ability to communicate across the galaxy with his ex-wife Lilandra. Of course, communication across the galaxy does not come easily and Charles needs to be concentrating and not performing any other psychic feats while he is doing this. The ease with which Charles can communicate over great distances varies depending on how well he knows the person. Being as he was married to Lilandra and spent some time with her, he was able to speak with her across thousands of light years without a secondary party augmenting his powers. Charles could contact any mind, provided he has a few rudimentary details to know what he is looking for, from halfway across the globe and could communicate with those close to him (like many of the core X-Men) at an even greater distance. Beyond this, Charles can also link minds together over these great distances and enable communication telepathically even between those who do not have any kind of telepathic ability. This works by Charles acting as a sort of telepathic hub, the messages being relayed to his mind and then transmitted out for everyone to hear. The amount of minds that Charles could link together with this power is great, probably the majority of the X-Men all at the same time, but with augmentation like Cerebra it could number in the hundreds or even thousands. Beyond simply being able to communicate with words, Charles is also able to transmit any image he pleases to a mind he is connected with. This is a rather useful ability that Xavier has developed, allowing him to temporarily 'borrow' certain skills and knowledge from individuals within a five mile radius to do tasks that he does not know how to do himself. An example could be neurosurgery - if Charles were able to reach out and find the mind of an accomplished neurosurgeon, he could probe it for the knowledge required to perform neurosurgery. This knowledge does not stay in his head, but rather he (without letting the person he is borrowing from know) shares the mind for as long as the task takes. This can work with mostly everything, but in areas where the population is exceptionally dense it may prove very difficult to focus on the right mind and most of the time Charles would not risk it in such a place. In fact, this would mostly be reserved for the Mansion, being as he knows who is who in the surrounding township and knows which mind to delve into. This requires little concentration, and Xavier can still perform actions while he is borrowing but it is not something he makes a habit of. This is the little brother of the mind probe ability, allowing Charles a cursory glance over the surface thoughts and emotions of anyone without some form of shielding preventing him from doing so. This basically means that Charles can, if he chooses to, hear what somebody is thinking as well as learn what emotions they are feeling just by concentrating a little bit. A mind scan only allows Charles to hear/see what is on that person's mind at that moment as well as sense whatever emotions they are experiencing, and does not allow him to go in depth with memories and such things. This only works within an area roughly the size of the Xavier Estate, allowing Charles to stretch out and learn what somebody is feeling. It does not work well over large distances as the signals begin to blur and he cannot accurately tell what is being thought or felt, but he rarely finds the need to use this ability over such a range. Finally, Xavier has the ability to project himself into the Astral Plane in whatever form he sees fit. This is, for all intents and purposes, the battleground of the mind - the place where powerful telepaths go to pit will against will. Charles can make himself appear however he wishes on the astral plane, suffering no physical restrictions but rather limited only by his imagination and his strength of will. Beyond being a place for telepaths to do battle, it is also a place for communication between telepaths, somewhere that they can go and find each other to communicate even if they are billions of miles apart. There are no limitations in the astral plane but it is a rather complicated alternative to take to simple mind-to-mind communication, as the telepath's physical form goes into a comatose state while their mind is on the astral plane and is totally unable to defend itself. Beyond that, the astral plane is as large as the universe itself and thus those not skilled in navigating it can get lost and have trouble finding their way back to their body. It is a dangerous place, because being torn asunder in the astral plane could mean so much damage to the mind that it is incapable of returning to the body. Charles is a powerful figure on the astral plane, however, and there are few who can hope to match him there - even the likes of the Shadow King have fallen to him here. Charles has very, very limited Telekinesis as a result of his extraordinarily powerful mind - but it is not something that he can use often. He suffers extreme exhaustion after using telekinesis, also experiencing burnout that may dull or even deplete his other mental powers for a few hours while he recovers. It is because of this that Charles does not actively use Telekinesis, but when he does he is capable of momentarily levitating himself and one other person, or lifting an object the size of a standard desk. This leaves him thoroughly exhausted however and it is because of this that Charles will not use this power unless there is an absolutely critical reason to do so. Charles Xavier is, as stated several times above, one of the foremost telepaths on the planet and subsequently he has a phenomenal mind - without a doubt his most powerful asset. It is because of this that it cannot be contained in a way that other minds can. For example, while Jean would be able to store the mind (at least temporarily) of an average person without any telepathic ability within her own head, Charles has a mind so vast and powerful that it is simply too large to be stored or locked away like that. Consequently, Charles' mind can rarely be imprisoned unless it is simply isolated - locked into an unconscious form where it has nowhere to go. Simply put, his mind is incredibly strong and capable of breaking through binds that would be unbreakable to a regular psyche, as well as manifesting truly godlike qualities on the Astral Plane. Finally, it is nearly impossible to suppress his mind using telepathy against him - his own powers, coupled with the strength of his psyche and his force of will make it an almost futile effort without some serious power. Charles is the man who had the dream of mutants and humans living together in peace and harmony, and took the first determined steps towards achieving it. Because of this, many people see Charles as a figure worthy of every respect they can possibly offer. Now that he has been revealed as having worked towards this goal for so long, most mutants who want to see his dream come to fruition automatically recognize his name and grant him respect for it. Charles is considered the Authority on mutant affairs across the globe, and consequently he is viewed as a saint by many within the X-Men (or used to be) and while this is excellent in terms of fame and putting him in a leadership position - it has a downside as described below. Although Charles has fallen from grace with his beloved X-Men, having revealed to them the great mistake he made in ignoring Danger when she became self-aware, Charles has not forever distanced himself from the X-Men. Although he is not currently with them, it is feasible that he could rejoin them in the future. If Charles were ever truly in trouble, it is highly unlikely that the X-Men would sit back and do nothing about it, but at the moment there is little else he could rely on them for. He is estranged from them, and they won't be making any efforts to contact him in the near future - one seems to attract some animosity by allowing something he created to go mad, almost kill his students, and then surrounding himself in a nuclear wasteland with a cadre of ex-villains. There are those within the X-Men still loyal to Xavier who would likely help him were he to ask, however, but who is for him and who wants him out of the picture remains a mystery for Charles. For now, at least. The Xavier School for Gifted Youngsters or Xavier's Institute for Higher Learning, or the Jean Grey Institute, is the school that Xavier publicly opened after his sister inhabited his body and revealed to the world that he was a mutant. It is populated with both accomplished mutant adults and students learning to master their powers as well as all the other things a teenager learns in high school without fear. Charles formerly served as the Headmaster of the Academy, leaving on sabbatical to help rebuild Genosha after Cassandra Nova took control of a group of sentinels and used them to lay waste to the island. Since then, Charles has had a falling out with his X-Men over Danger and is not expected to return as headmaster anytime soon. Effectively, Charles no longer has a job at the Academy but it is quite possible to assume that he would be able to return should he wish to, as it is based out of his house. Xavier returns to the Academy from time to time via the astral plane, but mostly to help with the long-term running of the school - and to see how things are going. He does not visit nearly as much as he used to though, as things seem to be getting along just fine without him. However, he is still responsible for hiring the majority of the staff members and many of them would gladly go out of their way to help him if he asked, and vice versa. In terms of the Mansion itself, out of which the Academy is based, Charles know it's layout dearly and even though it has been partially remodeled since he went away he would still have very little trouble finding his way around as he visits it via the astral plane quite frequently. He designed the underground passages where a majority of the hi-tech equipment and the ready room are, and so he knows his way around and could quite easily infiltrate it and bypass the security systems if he needed to. Charles could probably gain full access to the Mansion just by asking, however, if he came back - provided he had a good reason. He is not explicitly trusted at the moment. Put quite simply, Xavier has a net worth of approximately 3.5 billion dollars. Although a great deal of this is invested into the Academy and the wealth of technology utilized by the X-Men and other groups under their umbrella, there is still quite a hefty sum in Charles' bank account that is readily accessible by him - as well as in the various funds set up for his former students to make sure they never find themselves running low on money. This is not old money and is consequently not slowly depleting, but rather a series of wise investments keep his fortune at roughly the same level. Quite simply, Charles has the money to get whatever it is he needs to accomplish his goals. When not possessed by the Phoenix killing Xavier, Scott is perhaps the most loyal of his students. Scott has served for many years as the leader of the X-Men and more recently as co-headmaster of the Academy. Scott has never stopped believing in Xavier's dream, and even though Scott has been forced to view him as less than a saint in more recent years due to certain actions that have come to light, Scott still has great loyalty to Xavier no matter what he has done, it seems. Charles is grateful and truly views Scott as a son and although he would never show it, he values him greatly. Despite recent problems, if Xavier had a reason and came to Scott it is quite likely that he would come to his aid. Jean Grey, a woman that Charles saved from her own powerful telepathic abilities when she was only a girl. Charles once had feelings for Jean beyond the fatherly nature he exhibited with the rest of his students, and although this is pushed to the back of his mind and hardly ever worth thinking about - Jean, unbeknownst to Charles, is aware of this and thus can be somewhat standoffish with him at times. All the same, Charles would do anything he could to help Jean and vice-versa. If he were to ask she would likely come to his aid, and Charles would give her all that she asked for from him that was within his power to give. Once a nation that oppressed mutants, under the rule of Magneto it became a futuristic and hi-tech paradise for them - until Cassandra Nova. Controlling a fleet of sentinels, Cassandra rendered Genosha a nuclear wasteland and when Charles learned that Magneto had not been killed in New York he traveled to Genosha to aid him in rebuilding it. At the moment, Genosha is very little more than a nuclear wasteland, a few shanty towns the only refuges from the otherwise inhospitable ruins that stretch across the country. Despite all this, Charles has gathered a group around him here consisting of himself, Magneto, Dark Beast and Callisto among others to help rally the mutants of Genosha and rebuild their homeland. Although many would consider the characters Xavier has surrounded himself with in Genosha unsavory, he trusts them enough (or has enough leverage, in the case of Dark Beast) to see that they help in this monumental task. Xavier could probably rely on any of these people to help if it involved their task in Genosha, but beyond that he might be stretching it a little. Of course, those who survived the apocalyptic attack of the sentinels are there too, and more than willing to aid Charles in rebuilding their home. Now Genosha is little more than a concept, an ideal. But it still trives in the minds of Mutants even today. Like Utopia, it is a possible future goal of mutant haven formation. People just need to quit nuking his dream homes. Charles has a plethora of contacts, knowing all kinds of people and able to find at least one person who is in the know on every continent, as well as several sectors of outer space. Although his links with them vary, some such as Cadre K, while strong, are stretched over such a great distance that they cannot be summoned at a moment's notice to aid in the fight. There are also contacts right here on Earth, such as Amelia Voght, whom he has had a strenuous relationship with at best and thus he could not likely rely on her for too much - if anything. He has contacts within a number of underground mutant groups as well, ranging from simple mutant rights activists to quasi-terrorist cells and although he may not agree with or condone their methods, the fact is that many of them look up to him now that he has been revealed to the world as a mutant and he can quite easily put them on side with only a little bit of coercion. Finally, there are also a great number of politicians on both sides of the fence as well as renowned educators who know and respect Charles, and while they may be willing to meet with him they are certainly not falling over themselves to help him. Although he does not have ready access to it (the majority of it being stored in places like the Mansion), Charles has the knowledge to recreate and operate the great variety of technology that the X-Men have available. Although as of late, additions to the arsenal from Forge and other such inventors mean that Charles is not the sole inventor and gadgeteer behind the team, he can still get his hands on all the equipment that he needs if he finds himself at the mansion. This ranges from access to the Blackbird (although he'd need a very good excuse, given his current standing with the team - pardon the pun) to use of Cerebra and the other supercomputers throughout the Mansion. Charles Xavier is one of the foremost experts in the field of genetics, considered by the world at large to be the Authority on mutants and their genetics. He studied at Bard and Oxford, gaining a doctorate at the latter institution as well as learning a great deal over the years through study and from other prominent scientists. Charles is a certified expert in all fields of genetics, ranging from classical and molecular genetics as well as clinical genetics (the treatment of genetic disorders and syndromes in both humans and mutants). Perhaps his greatest knowledge in this field, however, resides in genomics, which is the study of large-scale genetic patterns over a wide area - specifically the rise of the mutant gene and the ever-increasing prominence of the mutant population. Charles is not only a skilled theoretician, but also understands the complex processes involved in genetic manipulation, making him a certified genius in every aspect of this field. Charles also has a doctorate in biophysics, a course he took in junction with genetics in order to learn more in-depth about the field of molecular genetics. Charles, therefore, is one of the foremost experts when it comes to the understanding of the human and mutant genetic code on a base level. Charles also studied the other fields under the giant umbrella of biophysics, such as nanotechnology and cybernetics (not initially, but while doing follow-up courses later in his life) but his expertise in these areas is not beyond that of somebody with a doctorate in each field respectively. When your power is, at its most basic, reading other people's minds a base understanding of psychology does a world of different. However, Charles has a degree in psychology from Oxford as well as decades of experience under his belt, making him a particularly gifted psychologist and adding to both his skill as a leader and a telepath in a phenomenal way. Basically, Charles has a deep understanding of every field within the sphere of psychology, ranging from understanding and diagnosing psychological disorders in others to knowledge of human (and mutant) behavior over abroad social spectrum. In short, Charles has an in-depth and broad understanding of the mind and this skill helps him to navigate it's complex corridors and pathways with ease. Although Charles has no official degrees in engineering, he has studied it extensively over the years as well as had experience with a broad variety of technologies that the general public can only dream about. Charles is responsible for a great many of the technological wonders that the X-Men enjoy, such as the two previous Danger Rooms, a number of the modifications made to the first Blackbird, Cerebro and most of the highly advanced security systems and amenities beneath the Mansion. Although he holds no official degree, it is safe to say that Charles is an accomplished engineer capable of developing all kinds of hi-tech gadgets given time and the resources. Charles has learned a great deal over the years, both in universities and through his own private study. Because of this, Charles has a broad spectrum of knowledge beyond the sciences described above - branching out into dozens of different scientific disciplines where he is on par with some of the most learned individuals in that field. It is a safe bet to assume that Charles has at least a rudimentary knowledge of even the most obscure sciences, and a very refined one when it comes to a number of other major disciplines like biology and physics. Charles led the X-Men for some time, his guidance helping them face off against extremely powerful individuals and perilous situations and win. Although he is a capable field commander (although Cyclops outstrips him several times over in that department), he serves better as the communication and information hub of the team - broadcasting out his own wisdom and knowledge to the team to help them save the day. Until recently, Charles was looked upon as a veritable saint who could do no wrong and although this has changed he still exudes a commanding presence that he has perfected over the years and is able to take command of a situation convincingly and build the spirits of others even when he, in his own mind, is unsure of which course of action to take next. Charles Xavier is a wealthy man, and he is this way because he knew how to take the money inherited from his father and invest it wisely. Because of this, Charles has a net worth of approximately 3.5 billion dollars and that value is only destined to go up. Put simply, Charles excels when it comes to investing and financial planning - he could open a firm and do very well. He has made sure that both he and his students with access to these funds will never be strapped for cash again. Charles is no Kitty Pryde, but he is still more than capable when it comes to computers - having designed the complex (but, as he found out, flawed) programs that governed the previous Danger Rooms as well as a number of other programs once used throughout the Mansion. Although Kitty's works have since taken over the largest percentile of the computers in the Mansion, Charles is still no slouch and is capable of building a complex supercomputer and programming/operating it with enough time and resources. He's quite a quick typist, too. Charles served in Korea and received basic training in the US Army weapons of the time, and has since had to wield a gun on more than one occasion. While he's no Deadeye, he knows how to handle the recoil of various firearms without breaking his shoulder or missing his target completely and can also reload and maintain a gun when he needs to. Charles isn't the greatest shot in the world, but he can still use a gun and - more importantly - point it in a threatening manner when he needs to. Charles has found himself in a perilous situation more than once, and for a man who has often needed to fight tough battles even without the use of his legs he has a keen survival instinct. He knows how to hunt for food when he needs to, a working knowledge of botany lets him know what plants are edible and which ones aren't, and he can also perform first aid very well (he has an MD but more on that later). While he is not adept at surviving in every situation and has his limitations (which are many), he is more than capable of getting by even in the harsh desert that was once Genosha. Charles greatly enjoys a game of chess, and is grateful for anyone he can find who will play with him - although the fact that Charles is a very skilled player has led some to think that he reads their minds while they're playing and cheats. This is not the case. Charles is simply a very skilled chess player, knowledgeable of countless different tactics and strategies to play out on the board as well as intimately familiar with all the rules. While he may or may not be able to hold his own against the masters of the game (he has never really competed to see), he does truly enjoy the game. Charles is an exceedingly capable linguist, able to fluently speak several languages. Among these are English (his native tongue), French, Hebrew, German, Japanese, Russian and both the formal and informal Shi'ar dialects. He also knows enough to get by in regular conversation in Indian, Farsi and Arabic, as well as smatterings of other languages. Due to the nature of his telepathic powers, he is able to pick up languages very quickly. Charles has an MD; making him a qualified surgeon as well as allowing him to act as a GP should he ever wish to. He has a working and up-to-date medical knowledge, specializing in ailments that mutants typically face and has familiarized himself with the varying internal structures that many of his mutant students sport. Consequently, he is capable of treating and even operating on not only regular humans but also on mutants who may have internal organs in very different places. While thoracic surgery is where the bulk of his skill lies when it comes to surgery, he knows a bit about every part of the anatomy and should the operation be particularly complex he can always use his telepathy to borrow the knowledge he doesn't have. While some may say that Charles opened his School for Gifted Youngsters as a front to organize his own personal army, the fact remains that Charles has taught control to many mutants who would have done themselves, or others, grievous harm otherwise. While he is skilled at teaching mutants to control their growing powers, he is also equally gifted when it comes to teaching more mundane things such as mathematics, history and French among others. Charles is a certified teacher, qualified to teach at the institute as well as at any other North American school that would hire him. Charles has lived a double life for many years, appearing to the public as the foremost expert on mutant affairs while privately actually being a mutant himself and leading the enigmatic group of 'mutant terrorists' known as the X-Men. When Cassandra Nova had control of his body, she made it public knowledge that Charles was a mutant and had led the X-Men for years so now Charles finds himself suddenly thrust into the limelight even further. While this allowed him to open the school to more students and set up the X-Corps, it has also made him among the top targets for anti-mutant activists who want to get their point across by killing mutants. This makes acting under the radar very difficult for Charles, as far as mutant affairs are concerned. Charles had his back broken by the alien being 'Lucifer' many years ago, and since then has had it healed and then broken again on a number of occasions. At the moment, it is broken. A portion his spine has shattered, rendering him unable to move his legs and confining him to a wheelchair. Although Charles is able to crawl using his arms, he moves very slow when doing this and so getting him out of his wheelchair effectively leaves him unable to escape. There is no modern medicine that can cure this for him, although nanotechnology or mutant healing powers may do the trick, Charles has seen them tried and then taken away before, and therefore has resigned himself to his wheelchair. Magneto and Charles, although they have worked together before and are working together at the moment, have conflicting ideologies and differences that just cannot be mended. They can work together for a short-term goal, but in the end they are diametrically opposed to each other and always wind up enemies again. Even though they would likely never kill each other unless absolutely forced to, the fact remains that at the end of everything they will likely be enemies and they both realize this - no matter how much they try to work together. Charles suffers from a fear that almost all with great power have. That he will let it get out of control and do something with it that he will truly regret. There have been several instances of this, a few examples including: the time he attempted to use his powers to change Amelia Voght's mind when she wanted to leave him, or when he grew so angry with Magneto that he erased all of his memories. Now while at times these sorts of actions may be necessary, Charles is forever fearful that he will fall back on his powers once to often and take to meddling with people's minds at every convenience - effectively taking away free will. Because of this, Charles is always reluctant to use his powers to affect opinions (besides nudging them in a certain direction, then relying on his own natural charisma to do the rest) because he is fearful of what may become of him if he does. Although Charles long ago mastered his telepathy and no longer receives unwanted thoughts and feelings (at least from other people) en masse, he still feels particularly strong emotions despite his own mental shielding and this can be a dangerous thing. Due to the empathetic nature of his powers, a heavy influx of a certain emotion can tilt his own mood in that direction. Thus, a sudden arrival of angry emotions could make Charles irritable and more ready to use the full extent of his powers than he otherwise would be. Another problem with telepathy is that there are certain methods available that can render a being immune or near-immune to telepathic incursion. Such things as Magneto's helmet completely block out his telepathy, making him unable to read Magneto's mind or affect it, the same with a number of other individuals who wear similar helmets. Wolverine's adamantium skull, while not impossible to read through, interferes greatly with the 'signal' and so thoughts and emotions are often not easy to discern if without heavy concentration unless they are on the very surface. There are other methods of shielding too that both dampen or nullify telepathy, such as psi-shields or natural resistance. Perhaps one of his greatest flaws is that those he surrounded himself with for so many years, his X-Men, viewed him as a saint - a man who could do no wrong and whose course of action was always the right one. While there are certainly a number among the X-Men who did not share this belief, a great many did and so in recent years it has put a terrible strain on Xavier's relationship with the X-Men. From Onslaught to Danger, Charles has shown that he can make errors in his judgment or think the wrong thing and he is by no means infallible. Those that viewed him this have grown untrusting of him; often going so far as to not see him as the man he has always been these many years. It is also because of this that, most of the time, Xavier attempts to uphold an image that he knows what he is doing no matter what happens and that he has all the answers and never makes mistakes. This can wear down greatly on a man, and Charles Xavier is no exception - he is not perfect, and if he keeps trying to maintain the illusion that he is with others, he may lose them forever. Charles has suffered from a shattered spine for some years, and although he has gotten over the pain of the crippling wound he still suffers the psychosomatic pain of it. Although most of the time this flaw is not an issue, on the occasions where Charles has been (through some power or technology) granted the ability to walk again, he has suffered extreme psychosomatic pain which sends him back to his chair. The fact remains that due to so many years of being confined to a wheelchair, Charles' brain may never again accept that he can walk if he is healed sometime in the future. Once his beloved wife, Cassandra Nova also played havoc with her mind when she inhabited his body and rendered her insane. When Lilandra Neramani came to Earth to attempt to assassinate Charles due to this madness, one of her aids officially annulled their marriage in accordance with Shi'ar law. It is uncertain as to whether or not Lilandra will ever be well again and if they will even get remarried after that, but as of this moment Lilandra, someone who Charles once loved, and still does love dearly, is now an enemy of sorts. Speaking of enemies, Charles has many. Any enemy of the X-Men can now associate him directly with them if they could not before, and being as he outwardly appears like an old man in a wheelchair there are no doubt a number of people out there who want him dead. These range from covert agencies within the US Government to your run-of-the-mill gun nut who wants to kill the muties. They can vary greatly and include both supervillain and average Joe alike. Needless to say, with so many enemies it can be quite difficult for Charles at times - he never knows just who will show up, baying for blood. Prior to Secret Wars, Xavier was killed by Cyclops in some Phoenix Rage. When Reed Richards rebuilt the 616 universe, the Phoenix placed the lifeless body of Xavier into the White Hot Room and began the resurrection. It is assumed by the world that Xavier is dead at cutoff. However, due to the revolving door of death, Xavier is destined to return. Logs tagged with "professor-x" will be automatically added to the page below. Logs uploaded before 6/25/2018 were for previous players of this character.